Sunday I spent a couple of hours talking to my oldest friend. She is exactly three months younger than I am and we’ve been like sisters our whole lives. We live on opposite coasts, so our main communication these days is very long phone conversations a few times a year. Sunday, after catching up on life and family, old friends and books, we ended up talking about writing. Our fathers were English professors, so maybe it was natural that we both loved reading books and writing from the time we were little. We wrote stories and poems and plays, performed some of them, too. Because it was fun. Mina went on to get an MA in English and teach professional writing for many years. I ran off to the theater, filmmaking, and journalism. Neither one of us writing fiction. Every ten years or so I’d painfully crank out a short story. Stash it in the proverbial drawer and go back to real life. But if you work at WMG for Kristine Kathryn Rusch and Dean Wesley Smith—among all the other wonderful writers who contribute to Fiction River and Pulphouse and participate in workshops—the joy of writing fiction kind of sneaks up on you, slips its little hand in yours and asks you to come out and play. So I did. And do. For fun. Kris blogged about her youthful writing adventures last week, and it rang a bell for me. Of course, she and Dean do much more than write for fun. Among other things, they have written a whole series of books on the profession of writing, the WMG Writer’s Guides, and Kris has a magnum opus called The Freelancer’s Survival Guide. Countless people have turned to these books for guidance. 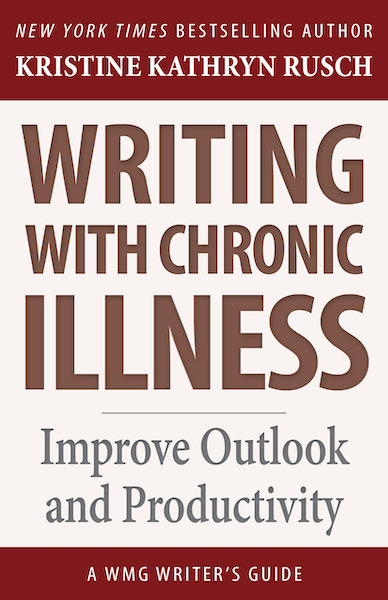 And now, just in time for Kris’s Spring Writing Storybundle, we are publishing her latest, Writing With Chronic Illness. A long-time sufferer herself, Rusch reports from the trenches. She tells us her own struggle with health issues and how they challenge her. But none of it actually derailed her career; she worked out ways to keep writing, and in the process became an international bestselling author with hundreds of books in print. Rusch helps writers customize a plan of action based on the writer’s individual experience. She shows how to increase productivity by developing a positive, and realistic, outlook. Importantly, Rusch points the way to reclaim the joy of writing, and celebrate success. The bundle has LOTS more in it, too. Look out for it on Thursday; it includes Dean’s lecture on Carving out Time for Your Writing, Kevin J. Anderson’s The Million Dollar Writing Series Boxed Set, and Mark Leslie Lefebvre’s Killing it on Kobo, and six more wonderful books of information and advice for writers. And now you see why I mentioned the importance of joy. Even if Dean and Kris didn’t talk, write, and lecture about joy often, anyone paying attention would surely detect that the enjoyment of writing is at the heart of what they do and why they do it. And I’m here to tell you it’s infectious. My friend Mina said I had inspired her to have some fun writing, too. Maybe we can trade some stories before the next time we talk…see? Infectious. I love spies. I have since I was a kid. In the mid-1960s I loved equally the blunt and brainy Harriet the Spy and the coolly calculating John Drake, hero of the TV show Secret Agent (Danger Man in the UK). The person I really wished to emulate, though, was Emma Peel. And I tried. I found somewhere a pair of soft ankle-high, zip-up leather boots with rubber soles that I could pad around in to watch and listen without being heard. But these spies were just the tip of the iceberg for me. I read every book by Alastair MacLean I could get my hands on: The Black Shrike, Where Eagles Dare, Ice Station Zebra. Graham Greene, Ken Follett, Frederick Forsyth, Ian Fleming, Robert Ludlum and the classic spies of the Cold War era were meat and drink to me. And then there was John le Carré. One balmy summer’s evening in my twenties I sat down under an open window to read Smiley’s People. From six o’clock until eleven I didn’t look up,I was so deep in the treacherous world of George Smiley. The next day I found out there had been a fatal motorcycle accident in front of our house, not twenty feet from where I sat under the open window. I’d heard nothing: crash, police, ambulance—nothing. Such is the power of the spy story for me. 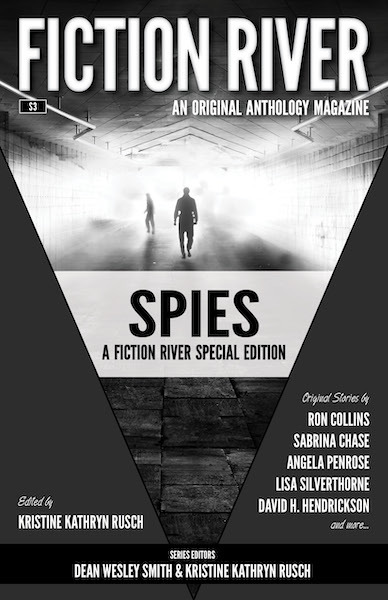 Imagine my delight when Kristine Kathryn Rusch put together the latest Fiction River Special Edition, and it was called Spies. Did I wait until it was published to read these stories? Of course not! The delectable thing about this anthology for a spy fan like me is that every kind of spy story is here. It’s like a tray of all my favorite foods. There is always a war going on, of some kind or other. Wars against slavery, racism, greed, power grabs, the Cold War, techno-wars, even a species war. And spies fight in those wars, sometimes with outright violence, but mostly with their brains and, yes, their hearts. Here’s hoping that as my fellow espionage lovers consume this volume of choice morsels—some of them bitter—no vehicles crash outside your windows to disturb you. Or not. 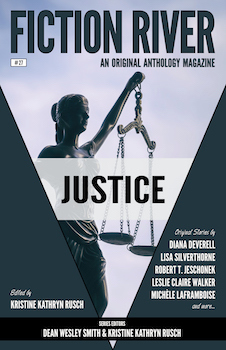 Speaking of great stories, we at WMG want to send our hearty congratulations to Diana Deverell whose story “Mercy Find Me” from Fiction River: Justice, edited by Kristine Kathryn Rusch, has been chosen as a finalist for a Derringer Award. It is the poignant story of a woman who comes to terms with both retribution and mercy, as well as her own failings. Diana says the story came straight from her heart. It sure touched mine. Pick up Justice, available as an ebook or paperback, read Diana’s story—and then keep reading! By Gwyneth Gibby, guest blog. Spring has sprung! 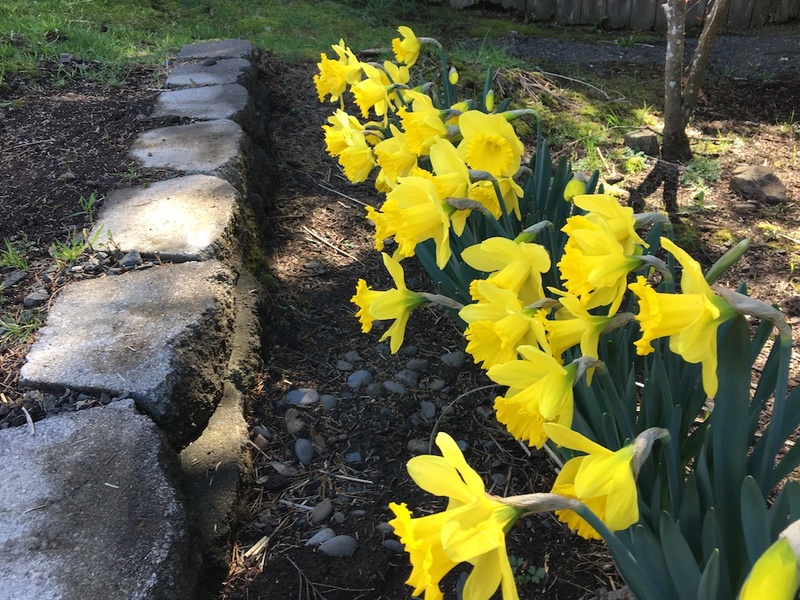 Allyson’s daffodils, ready to burst into bloom a week ago, now bob gently in the breeze with all their sunny yellow glory. Mine, on the other hand, although right next door and planted on the same weekend, are still just thinking about it. Flowers have minds of their own, just like cats do, and there’s no point trying to rush them. My mom, whose favorite flowers were daffodils, used to go out to her garden and tell them, “It is your duty to grow!” And they did. Which it has here at WMG. We think spring means romance. Magical fragrant evenings, sweet birdsong, softness in the air with the bite of winter gone like a half-remembered dream. April in Paris may not be on the agenda for everyone, but we have the next-best thing: Kristine Grayson’s new omnibus from the Fates Universe, The Charming Trilogy, Vol.1. Sit yourself down in your favorite reading chair, next to an open window perhaps, settle in and read three romantic novels, back to back, from the fairy-tale land of charming princes, sleeping beauties, and the bumpy and sometimes hilarious road to happily-ever-after endings. 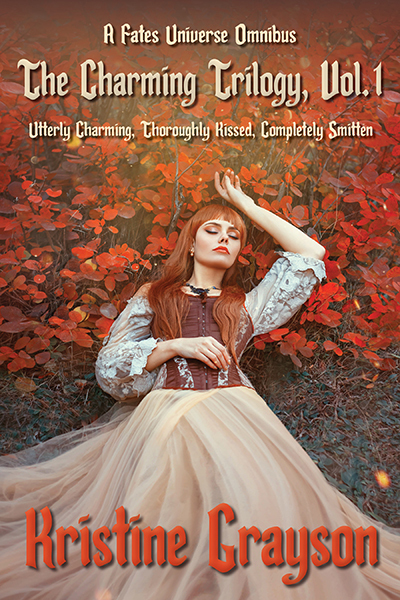 Utterly Charming, Thoroughly Kissed, and Completely Smitten will thoroughly and completely charm you with hours of reading bliss. This is the first of four omnibuses of Grayson’s work coming up this spring, one each month. Keep particular lookout for a brand new Grayson novel in the Fates Universe, Hidden Charm, coming in June. For those with a taste for more intrigue, also out this week is Fiction River Special Edition: Spies. The award-winning editor Kristine Kathryn Rusch chose these fifteen stories that range from satire to brutal realism, all from the secret world of espionage. What links these stories, besides their wide variety of spies and spying, is their willingness to look at the world in all its messiness. The stories don’t flinch from the effect that secrets have on those keeping them (or those who are victims of them). The other thing that links the stories is their entertainment value. Even as I reread them, I couldn’t put them down. Even when I knew what was going to happen. The writing is compelling, the characters more so, and the situations memorable. The writers in this volume outdid themselves. Happy reading, but remember to come up for air and stroll through the sweet flowery air of spring. The daffodils my husband planted this winter are just about ready to pop open and reveal their buttery yellow heads, and I must tell you, I’m more than ready for spring this year. Part of the reason is the new crop of book projects we’ll be releasing. I already told you about the Grayson news last week (to read that blog, click here), and now I have two new Storybundles to tell you about—and one of them includes our first Fiction River Presents release of the year! Dean Wesley Smith has curated a space opera Storybundle that launches Wednesday and has three WMG products: Dean’s Star Rain: A Seeders Universe Novel, The Runabout: A Diving Novel by Kristine Kathryn Rusch, and that new Fiction River Presents volume I told you about called Among the Stars. “H-Hour” by Steven Mohan, Jr. 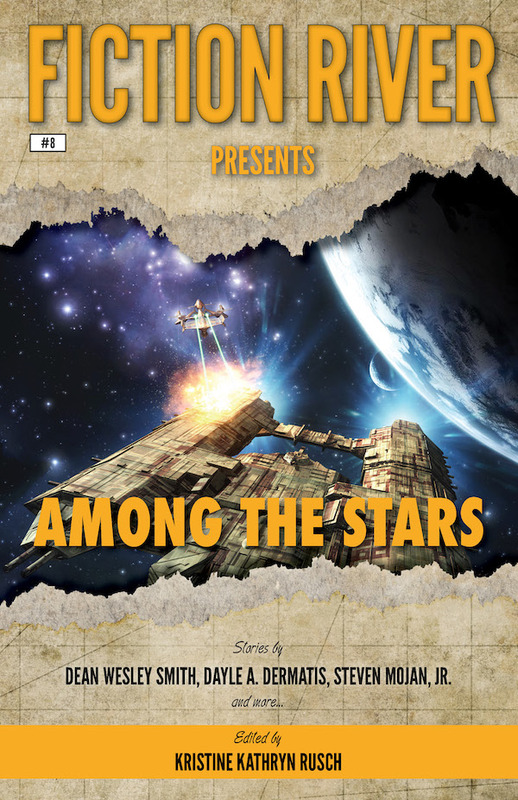 Subscribers of Fiction River Presents will receive Among the Stars automatically. To learn more about subscriptions, click here. But if you’re looking for something to buy now, and you’re a fan of epic fantasy, Kevin J. Anderson has curated a bundle that includes not one but two of Kris’ Fey books: The Sacrifice: Book One of the Fey and The Changeling: Book Two of the Fey. Called the Truly Epic Fantasy Storybundle, you can get the two Fey books as well as thirteen other books for $15. Click here to learn more. So, what are you waiting for? You’ve got a lot of reading to do. My daughter, Nola, is determined to catch a Leprechaun. She builds a new trap every year. I’ve included a photo of this year’s version. Needless to say, she never catches one, but she finds “evidence” of their visit every year. The irony: I don’t plant that evidence. This year, the evidence was in the front yard. She decided the leprechauns left some green ties in our yard. Now, those ties have been there since before she was born, but she never noticed them. Ah, the power of wishful thinking. Obviously, I know she’s never going to catch a leprechaun. But I won’t discourage her from believing she will (even if I have to spend $40 on craft supplies). I firmly believe everyone needs a little magic in their lives. So does Kristine Grayson. 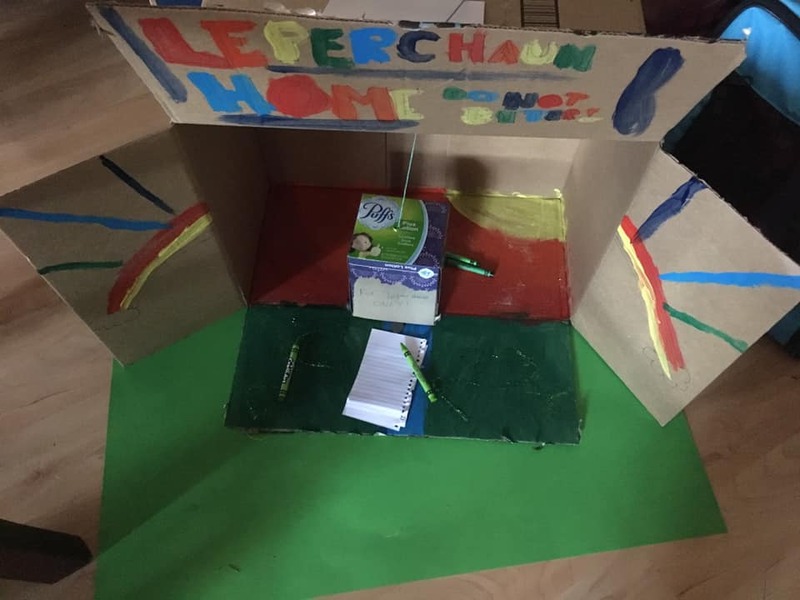 She put her own twist on the legend of the leprechaun in her story “Cosmic Balances, Inc.” Click here to read the synopsis and download that story for free for one week only. 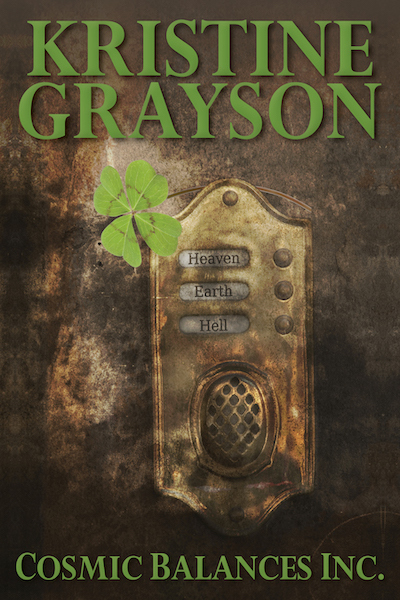 We’re entering an exciting time for Grayson fans. Next Thursday, we’ll be releasing the first of four omnibuses. It’s called The Charming Trilogy, Vol. 1, which contains the novels Utterly Charming, Thoroughly Kissed, and Completely Smitten, along with a ton of bonus materials. We’re also rebranding the series to better align it with the genre and provide a comprehensive reading order. So, watch for a relaunch of Completely Smitten and a redesign of the Grayson website to correspond with the omnibus release. I’ve included the covers of the omnibus and Completely Smitten to give you a sneak peek. We’ll release a new omnibus every month, in series order, until June (along with any rebranded books we have the rights to publish). Now, I saved the best news for last, because in June we will have the first new Grayson novel in years, Hidden Charm, so stay tuned for more information on that release. We’re in for a magical spring. Kristine Kathryn Rusch’s Retrieval Artist novels are dangerous ones for me to work on. Dangerous, because of the amount of time it takes me to do anything with them. You see, they are so compelling that I get sucked into the narrative and can lose vast parts of my day reading. It happens every time. The books are that good. And obviously, I’m not alone in thinking that. This series is extremely popular with fans and reviewers alike. And now it’s on sale in ebook for a limited time. The series has garnered much more acclaim, but you get the point. 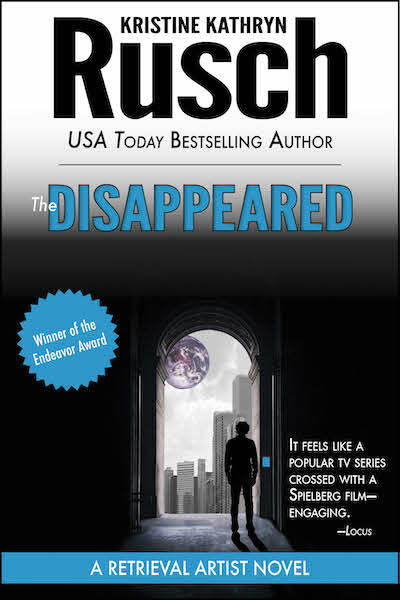 For those of you who haven’t yet experienced this intriguing universe, you’ll want to start with The Disappeared, which is available for free for a limited time in ebook here. This Endeavor Award-winning novel is Flint’s first adventure, the story that turns him from a police detective in the Armstrong Dome on the Moon into a Retrieval Artist. The rest of the novels in the series (all 14 of them) are $3.99 for the ebook (again, for a limited time). There are seven books in the original series and another eight books in the Anniversary Day Saga. You can read more about the series and find the complete reading order here. Just remember that I warned you about these books—once you start reading, you’ll find it very hard to stop until you get to the very end. Now, that’s great writing!